NOT YOUR AVERAGE BIKER CHICK! We had a rather illustrious visitor into our Guildford store the other day. Elspeth Beard is known by many people in the area as a renowned architect who specialises in what one might term slightly quirky properties. Her most famous project, though, is the stunning water tower that spreads its rooms over no less than six floors, which Elspeth converted when she was still training to be an architect, and in which she now lives. 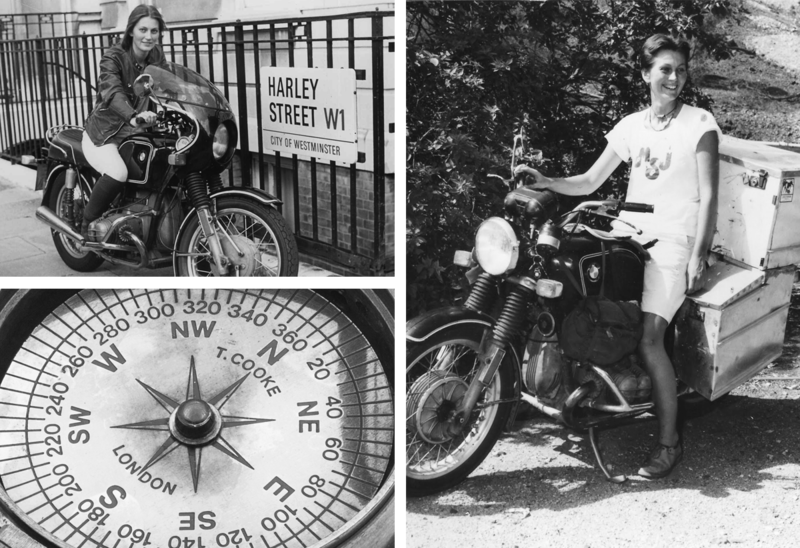 But amongst those in the know, Elspeth is even more famous as the very first British woman to ride around the world on a motorcycle. She was just 24, and only halfway through her studies, yet she decided to put everything on hold to circumnavigate the globe on her trusty 1974 BMW R60/6. Her travels took her first to America, then Australia where she replenished her funds working in an architects' practice. After Singapore, she travelled into Asia and then Pakistan, before riding back through Europe via Turkey. The total trip, of course, was not without its trials and tribulations but, with 48,000 miles under her belt, she returned to London some two years after she had departed. She still rides today and, as you would expect, Elspeth is no fair weather rider. She puts in serious mileage every year, and still finds herself putting a bike through its paces in some pretty demanding terrains. But funnily enough, she’s never had any real motorcycle gear. 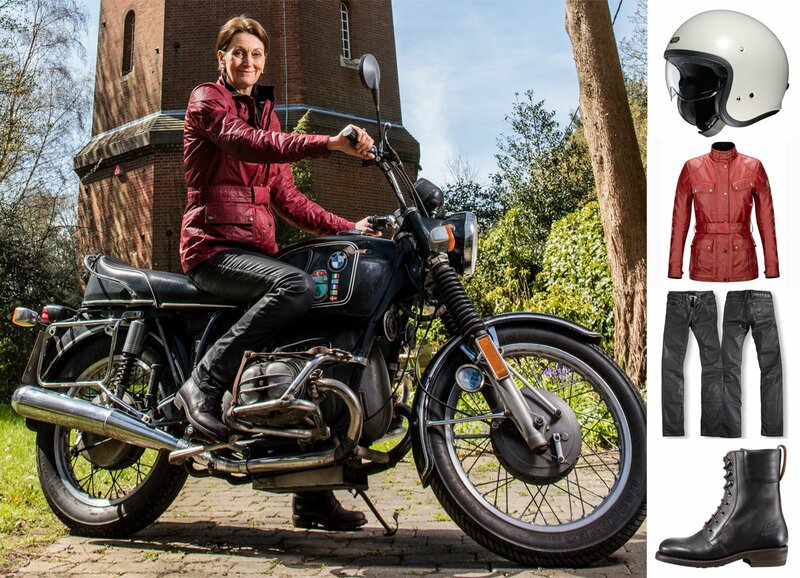 When she first took up motorcycling, there wasn’t much on offer, and she’s made do with a wide array of leather, wax cotton and textile outfits, many of which were never designed for wearing on a bike. 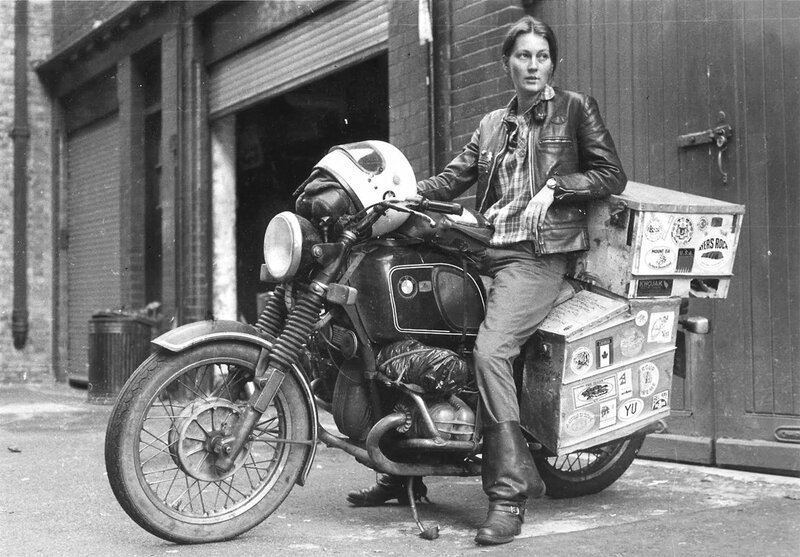 Elspeth Beard in the 1980's when she circumnavigated the globe on her trusty BMW. She came in to see us to choose a couple of new outfits. We spoke to her about her current requirements, and it didn’t take us long to home in on Halvarssons' Electra jacket and its matching pant as the perfect combination for what one might term her serious riding. Hot or cold, wet or dry, we felt the Electra would do the business, but Elspeth was looking for more than mere functionality. It also had to look great on. Look at the photos of her when she was in her twenties, she was of model-like beauty. And even now, some forty years after her adventure, she still cuts a striking figure. She’s tall, skinny and has unfeasibly long legs, but whilst this has defeated her desire to find motorcycle gear in the past, Halvarssons makes the Prince in a long leg, so the pants fitted perfectly. As indeed did the jacket. We tried several pairs of gloves, but eventually ended up, one more time, with Halvarssons. The Advance glove was perfect, in both weight and fit. Job done. For a helmet, Elspeth went for Schuberth’s new E1. She still rides a BMW R80GS PD, and so the adventure styling of the helmet was just right. This wasn’t her first flip-lid, but with the miles Elspeth puts in, she needed something extra quiet. The E1 seemed to fit the bill. On her feet, she walked out with a pair of Daytona Lady Stars; perhaps the perfect boot for the serious lady motorcyclist. 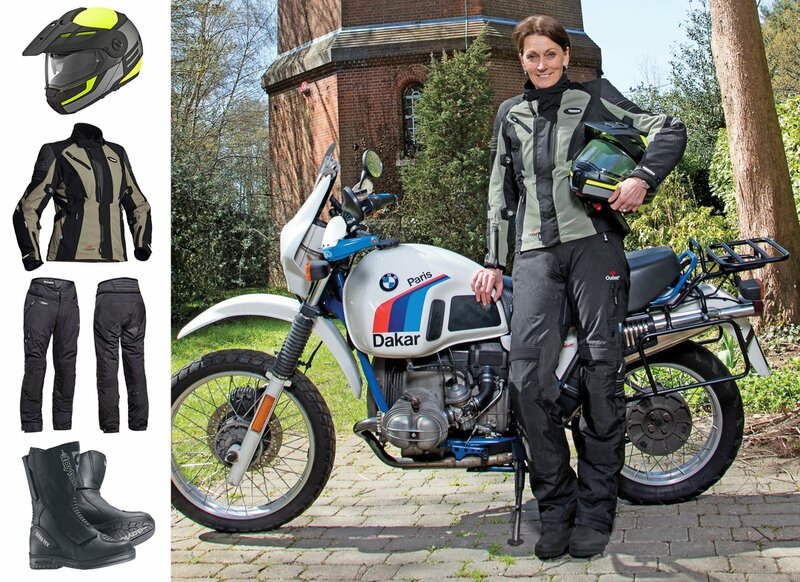 Elspeth Beard in her new technical outfit... A Schuberth helmet, Halavarssons jacket and trousers, and Daytona boots. Click on the thumbnails to view these products. We were pleased as pie to have found clothing to meet Elspeth’s demanding requirements, but she wasn’t satisfied with just one outfit. She also wanted some gear that was a bit less functional; something she would wear in the summer when the sun was out. Something that she could feel safe in on the bike, but something that wouldn’t make her look too much like a biker. The pants were quickly sorted. Rokker’s Diva jeans don’t fit everybody, but they do look amazing on those who can fit into them. Elspeth fitted them. For a jacket, we recommended a Belstaff Trailmaster. The ladies' version, with its six ounce material, is actually much nicer than the men’s version in the summer. Elspeth was initially sceptical; she still had the heavily waxed and well-worn Belstaff she took with her on her big trip. But we assured her that the modern Belstaff, with its D30 armour, waterproof membrane and removable thermal liner, was in a different league. Once she put it on, that was it. She was smitten. Here was a motorcycle jacket that looked great, but which performs at the highest level. She also wanted a pair of short black boots. Now Elspeth clearly has an eye for the finer things in life, and was hypnotically drawn towards Rokker’s new ladies’ boots. We were impressed. Their new boots are brilliant. You could walk around all day in them, but equally they’re tough enough to ride around the world in, if Elspeth ever decides to give it another go. For her summer clobber, Elspeth wanted an open face helmet. We’d just got in the new Shoei JO. It’s not the cheapest open-face on the market, but it’s probably the lightest, and almost certainly the most stylish. Elspeth's second, more casual outfit... A Shoei helmet, Belstaff Trialmaster jacket, a pair of Rokker trousers, and some Rokker boots. Click on the thumbnails to view these products. She walked out a happy lady. At last she had some proper, modern riding gear, and one couldn’t help but wonder how much easier her trans-global adventure would have been if, back in the eighties, Elspeth had been able to equip herself with the type of high quality gear we all enjoy today. Still, back then, bikers were a tougher bunch. Even the lady bikers! CLICK HERE to buy a signed copy Elspeth's new book.